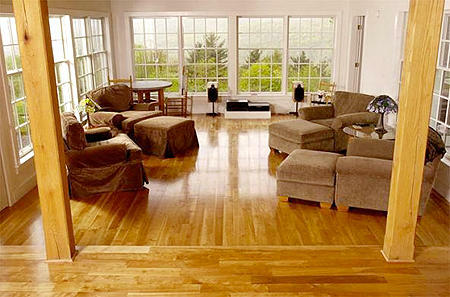 Unfinished flooring refers to flooring that requires sanding and finishing on site after installation is complete. This type of solid hardwood flooring is typically 3/4" in thickness, tongue and grooved with end-matching, and available widths range from 2-1/4" to 5" wide. Plank flooring wider than 5" is available, but ordinarily on a special order basis. Unfinished flooring is usually a square-edged product with some exceptions. Board lengths on manufactured flooring will range from 12" up to 78" on a random length basis. Long length flooring is available on a special order basis.